Freecharge Britannia Good day Offer is one of such offers like Paytm Bourbon Offer, Paytm Garnier Offer, Sewtwet 100% cashback Offer and more. 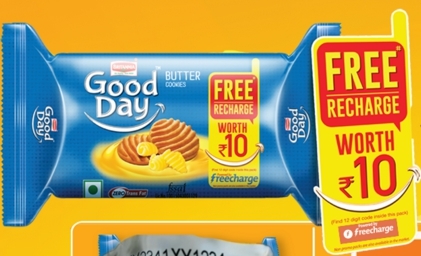 In this you can avail free recharge of Rs 10 or Rs 30 with your purchase of Britannia Good day Biscuits. Buy a pack of Britannia Good Day Biscuits get your unique code in your pack. Visit offer page and get your free recharge from freecharge. You can redeem that free recharge coupon on freecharge website as well as on app. This coupon will enable you to do Rs 10 or Rs 30 worth free mobile recharge or if your transaction amount is greater you will get discount on the order value (Rs 10 or Rs 30). 1. Buy a Pack of Britannia Good Day Offer Pack and find your 12 digit unique code inside the pack. 3. Use your unique code for Mobile recharge, DTH, or bill payments etc. 6. Login or signup into your freecharge account. 7. Enter Promo Code (12 Digit unique code in the pack) and Apply. 8.You will get discount on your transaction value worth Rs 10 or Rs 30 depending on your coupon value. 1. Pack of 250g will get you Rs.30 Recharge Coupon and 75g pack will get you Rs.10 recharge coupon. 2. Offer is valid from 25 December 2015 to 25 March 2016. 3. One Code to be redeemed against one transaction only. 4. Balance amount (if any) should be made through Debit/Credit card only. 5. Offer is valid for maximum 3 times per user during the offer period. 6. Valid for All Users, New Users as well as Old users also. 5 Responses to "Freecharge Britannia Goodday Offer – Rs 30 Free Recharge"
Very nice offer … I have collected 10 bourborn oackets but last daye missed paytm bourborn offer more than rs 200 loss ..